Our favourite sweet Mango can not only use as a sweet dish in Indian sweets, for ice – cream or shakes & smoothies but this juicy fruit can also make a khattamitha, spicy yummy dish like Mango Salsa. 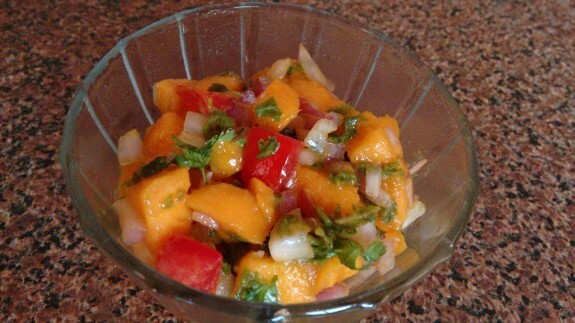 This delicious fresh mango salsa is super easy to make with some basic ingredients. It can go perfect as salad or side dish with tacos, grilled fish, chips etc. To make the salsa spicier, you can add jalapeno, however, I did not use Jalapeno in my dish as I don’t want too much spicy Salsa. 1. Take a medium size bowl and mix chopped mango, bell pepper, jalapeno, onion, lime juice and lemon juice. Mix everything well. 2. Now add chopped mint leaves and cilantro and again mix it well. 3. Add little rock salt and sugar and mix again. Cover and allow to sit at least for 15 - 20 mins before serving. 4. You can keep this in refrigerator and serve it chill.